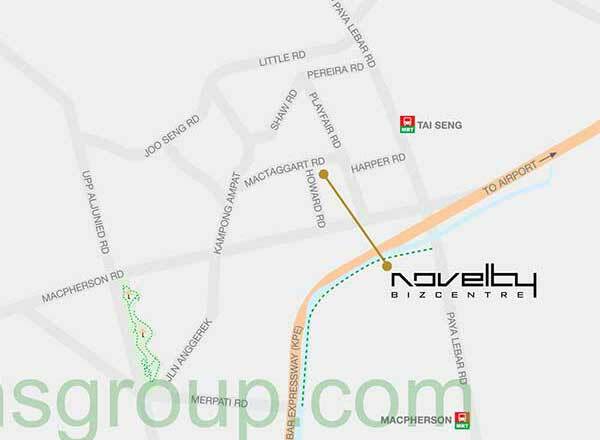 Novelty Bizcentre location is at 18 Howard Road Singapore 369585 in prime District 14. Experience convenience at it's finest! Perfect Location! Everything is within easy reach. The development is nearby to NEX Shopping Mall, Upper Serangoon Shopping Centre for wide range of amenities such as retail shopping, grocery, banks, and more. The famous Marina Bay Sands, Orchard Road, and Central Business District (CBD) are just a short drive away. Just a stone's throw away to numerous prestigious schools include Maha Bodhi School, Cannosa Convent Primary School, Cedar Primary School, Macpherson Primary School, Geylang Methodist Primary School, Paya Lebar Methodist Girl School, Bartley Secondary School, Manjusri Secondary School, and ITE Macpherson. Novelty Bizcentre is well-connected to some MRT stations such as Paya Lebar MRT, Macpherson MRT, Tai Seng MRT, Eunos MRT, Bartley MRT, and Aljunied MRT. It is close proximity to major expressways like East Coast Parkway (ECP), Kallang-Paya Lebar Expressway, Pan Island Expressway (PIE), and Central Expressway (CTE). Novelty Bizcentre Price is attractively priced to sell. Call us now at 6100 0877 for latest unit availability and pricing.